Life without Facebook is probably a wonderful place where your mom doesn't know you got drunk last night, you don't have to hear your old schoolmates' terrible opinions on everything, and you're blissfully ignorant of birthdays. The rest of us, though, desire a modern life and thus are forcefully sucked into the Facebook vortex. Porsche, at least, is making it slightly more palatable by creating a custom tool that'll allow you to create one of those annoyingly narrow timeline cover photos that isn't just a poorly cropped version of the space between your chin and belt. Using various layers (anyone who uses Photoshop will be familiar with the concept) you can choose a Porsche from various eras, backgrounds, stylized graphics, and text to create the ideal message. The system is a little clunky and you're probably handing over all of your deepest, darkest secrets to them — as if they don't involve Porsches anyways. My best advice to you is look at all the options and then build what you want starting with the background and moving to the foreground. I did this vaguely Martini livery-inspired graphic first, then threw on the 917K because it's got a great angled look for a Timeline and, oh, why not a little text? Once you generate the image it'll save a version in your photo album, which you'll have to approve. Once you do that click on "change cover" by scrolling over your timeline cover photo and select your newly generated Porsche image. Voila. Your Porschephilia becomes even more obvious. 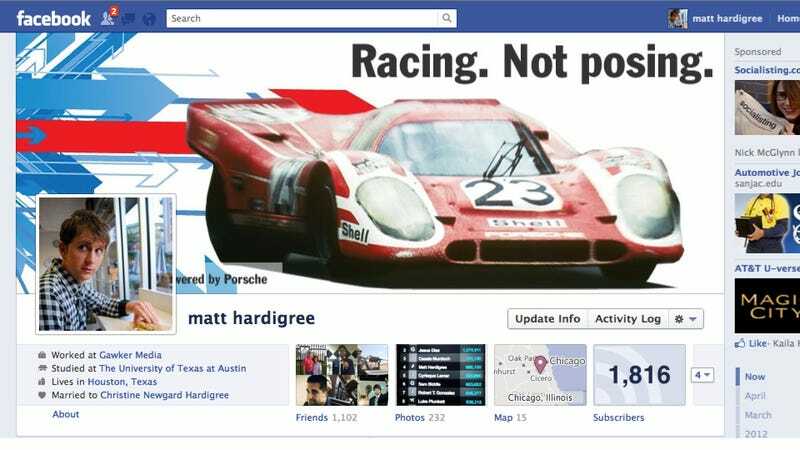 The "Powered by Porsche" text mistakingly goes underneath your profile photo, but otherwise it lines up nicely. Find the App right here and share your own Facebook cover in the comments below.